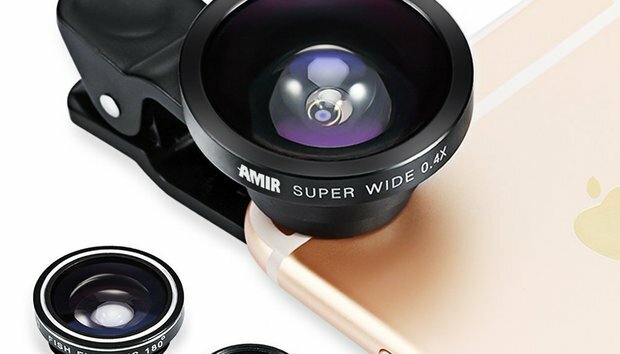 With this lens kit from Amir you can take high clarity, professional photos wish fisheye, macro and super wide angle format from virtually any cell phone. These professional HD lenses reduce glass flare & ghosting caused by reflections. A universal clip design makes it easy to attach to most cell phones, iPads and PC's as well. The fisheye lens capture images at 180-degrees, wide angle lens at 140-degrees and the macro lens magnifies 10x with a minimum object distance of 10-15mm. The lens kit receives an average of 4.5 out of 5 stars on Amazon (read reviews). Regular price is listed at $39.99 on Amazon, but with the current 68% discount you can gift this kit to yourself or an aspiring photographer for just $12.88.